Fishing this month continues to be solid but definitely not off the charts just yet. For every 3 or 4 trips on the water there is always a tough day in there where the fish don't want to cooperate. But don't give up hope just yet. 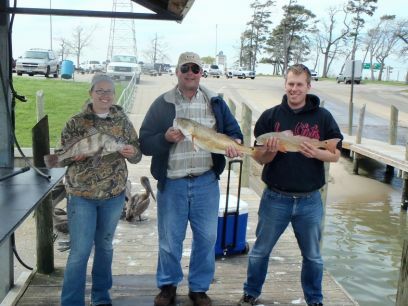 Spring is on its way and warmer water temps will put these fish in a much more aggressive mood. 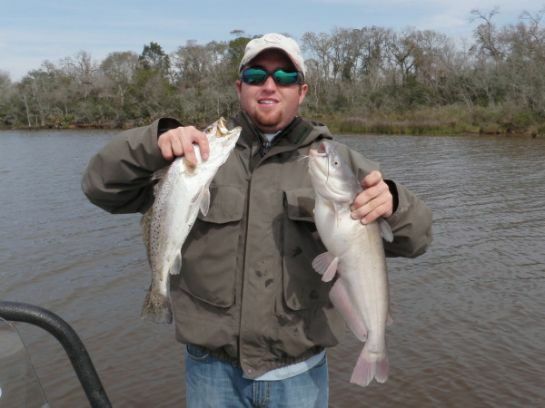 We just need a little warm weather to get a good feeding frenzy to take place over the shallow flats of our areas. The last 2 weekends have been fun but we have had to work hard for our fish. Quality time with a dad and his son! Specks have been showing up in all different areas and moving around steadily. Thankfully we have had some decent winds to keep us covering ground and locating schools. 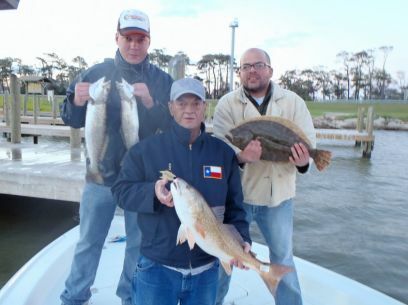 Lots of black drum have been caught in the 2 to 35 pound range. Flounder have been rare and usually undersize but we have been catching about 1 to 3 a day and if we are lucky 1 might make it in the box. Very special time with dad! 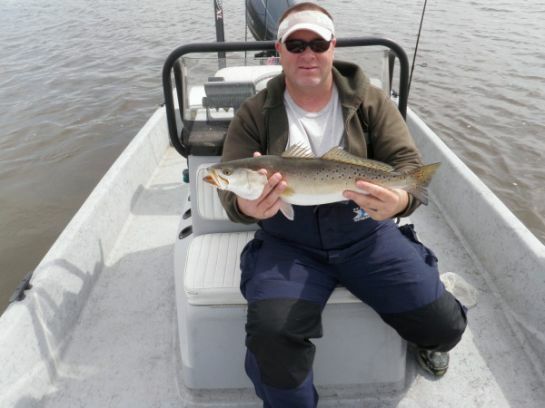 The redfish haven't been around as much these past two weekends with only 1 or 2 hitting the cleaning table each trip. 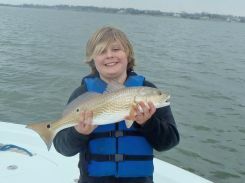 We have run in to a several schools of rat reds which are fun to catch but they won't fill up the box till next year. We are still in that wintertime pattern where the fish want to be hanging around thick mud and shell. 1/4 oz jig heads and soft plastics like the Mrs Trout Killer in Morning Glory have done very well in 4-8 ft water depth. For live bait the standard popping cork and shrimp has been working well for catching the big 5. 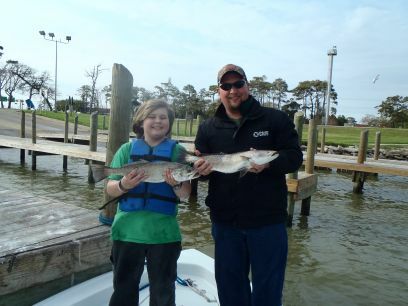 Spring Break is just around the corner so make sure and take a kid fishing. They deserve it!!! 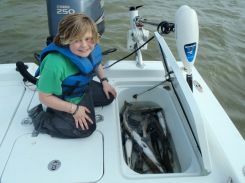 Not a lot of days on the water this past week with rain hampering almost all of my trips. Really can't complain about the rain since it is so desperately needed here in Texas. 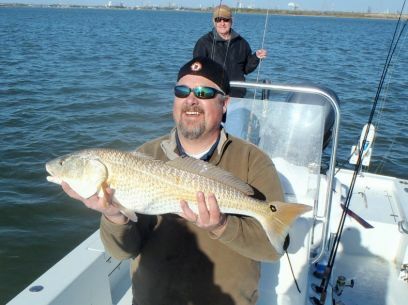 Wednesday and Thursday were scouting mission preparing for future trips I have to admit that fishing has not been very good this year so far and all of this rain has just wiped out my patterns in the upper portions of Galveston Bay. After talking to a few guides it seemed that the only ones catching fish were doing so way up in creeks and back lakes so that was the plan. Capt Robert Liebert and myself launched around noon on Wednesday and decided to hit some back bay areas that most people do not fish and it was crazy good. I think we had a our first fish on the 3rd cast and it was almost every cast or every other cast for 100 yards. Whenever we are scouting we don't like to sit there and hammer them out. So we moved on to the next spot and it was the same thing. Lots of trout being caught. The key was finding the right water depth. Fishing in 3 ft of water wouldn't produce a bite but as soon as we would hit that 4 ft depth it was on. We hit a few more spots in the back lakes and caught fish on every stop. Not a lot of keepers in the other spots but plenty of bites. We hit some areas in the open bay without a bite. The next day we wanted to come up with plan B and we hit a totally different area but with the same environment. A shallow back lake with a few areas that held the magic depth of 4 feet. We made a few long drifts in areas of 3 ft without a bite. But again as soon as we hit the right depth it was on again. These mild conditions have continued now thru early January and the the water temps are hovering in the mid 50's. Time to get those warm winter clothes out and get ready for some of the best fishing of the year. This last cold spell has brought our water temps down to the mid-50's with lower water levels. 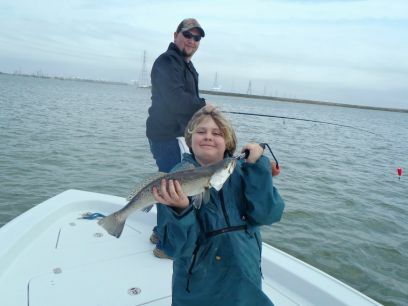 Because of those conditions West Galveston Bay becomes a great fishing destination to target the "Big 3".